Never in her wildest dreams did she think after her first husband had passed away she’d get a second chance at love. Hannie Toerien from Kuils River, Cape Town, was privileged to be married to her dream man for 50 years, a milestone for many couples. But never in her wildest dreams did she think after her first husband had passed away she’d get a second chance at love. >Hannie’s granddaughter and well-known local designer, Janita Toerien, revealed how Hannie and her second husband John’s romance had unfolded. "I never saw my grandma and grandpa fight, never heard them speak harshly of one another, always only saw the love they had for each other,” Janita recalled her grandparents’ relationship. “But when my grandpa passed away [a few years ago] there was an immense emptiness (for her grandma). Where once there was a partner to drive around with, have coffee with or just hang around with, now there was no one,” she explained. “Then, around September 2015 my gran started talking about this man, John, and like a schoolgirl she didn't really stop,” Janita writes in moving post on Facebook about Ouma Toerien – as she’s affectionately known to her family. 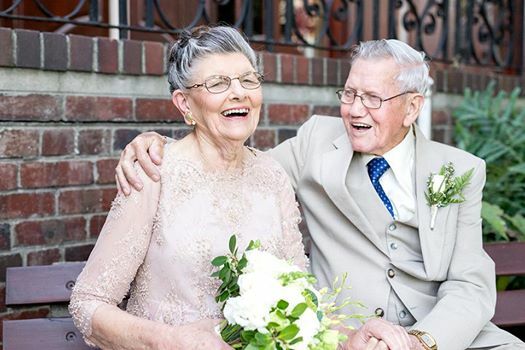 In time Ouma Toerien would follow her granddaughter’s advice and after John had first asked Janita’s dad permission to marry Hannie, the couple tied the knot on 7 May at a fairytale wedding which has had the internet tearing up, Janita tells YOU. Hannie has kept her own surname and remains a Toerien. It’s her birthday too on Wednesday and she and John Wolmarans (also 86) live in Kuils River. “She was just going to wear her best church outfit for the occasion but I insisted we’re making time for her dress!